There is a new kind of crossover coming to town. Be prepared to downsize a bit. The need for this is simple: parking. If you live in Uptown Minneapolis or along Grand Avenue in St. Paul, you may live in a place where parking is at a premium. There may be parking at your building, but even the spaces are limited. There will always be that neighbor who have to have a three-quarter ton pickup parked in the primest spot at your building – or, right in front of the building on the street. If you are that person, please accept our apologies. We are trying to make a point somehow. There are already some choices in the market segment. The MINI Countryman, Buick Encore and BMW X1 represent the niche nicely – even as they are on the upper edge of the niche’s price range. The bottom end of this group includes the Kia Soul, Nissan Cube and Scion xB. You might find that these smaller crossovers may not be as adequate as you like them to be. There could be not enough cargo space or rear seat room. Fine, you could always upgrade to the next level – an already crowded segment ranging from the Subaru Forester all the way up to the BMW X3. However, you can find some middle ground. This is where the Mitsubishi Outlander Sport comes in. The smallest Mitsubishi crossover was conceived as a global product for places where population density is even tighter than our own urban enclaves. It came to our shores as an alternative to the growing small-ish crossovers that have grown in size and stature over the past few years. The newest 2013 models are now being built at Mitsubishi’s plant in Normal, Illinois – a sign that Mitsubishi is serious about contending here after one of its rivals ceased to sell automobiles in this country. The Outlander Sport may appear to be just right, but how? It starts with a combination of current Mitsubishi design traits and some creative packaging. Up front, you can see the family resemblance that began with the Lancer compact sedan. 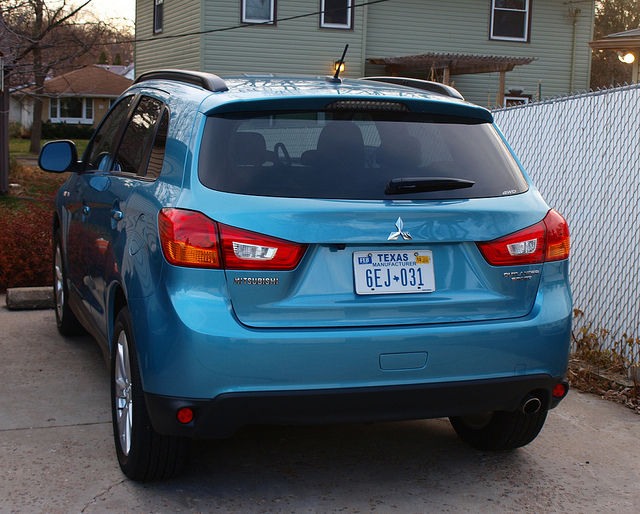 In fact, the Outlander Sport is based on the Lancer. The creative packaging comes with huge doors that offset a normal (read: Lancer) sized hood. If you are comparing the Outlander Sport to a Honda CR-V, Chevrolet Equinox or Ford Escape, the cargo hold may seem comparatively small. That is another sign of creative packaging – the liftgate is also quite large and accommodating of wider packages. The SE AWC model driven for this review came with another cool feature – a full panoramic roof. A touch of a button slides the shade to reveal an infinite sky. None of the panels open, but it might not be necessary. There is enough glass all around to make you feel as you are outside letting the sun in. The truth about the Outlander Sport is its size – only 169 inches long. These days, that means a lot. It means you can get into tight parking spaces on the street. It also means there is not a lot of crossover to tackle the mall or club. To put this in perspective, the Outlander Sport is exactly the same size as the upcoming Buick Encore. All other competitors start at six inches longer and beyond. For the driver, sitting behind the wheel gives the driver a full view of everything ahead. The cowl is low, but the instrumentation is angled to the driver with an easy to read display. The switchgear is simple and straightforward, nothing too fancy and complicated here. Though the hard plastics around the cabin would put some people off, they appear to be quite durable. Seating in the Outlander Sport is also simple and straightforward. Front seat occupants get bolstering in the cushion, the seatbacks would need a bit more. Manual adjustments are expansive for every body, though power adjustments would be better. The Outlander Sport would soon be available with power adjustments in the coming year. Once you get used to these cloth seats, they are quite comfortable and amenable for long drives. Lumbar support would definitely be the crowning touch for at least the driver’s seat. Rear seat room is a bit tight for long-legged occupants, but average-sized adults would have no problem finding a place back there. The cargo hold is quite generous, which is deceptive given the short deck of the Outlander Sport. Rockford Fosgate supplies nine speakers of powerful sound from an audio system that incorporates AM/FM/SiriusXM, USB connectivity, a music server and Bluetooth audio streaming from your mobile device. Sharing the full screen are a nice navigation system and a rear-view camera. Not to mention that the Bluetooth connectivity with your phone is very easy to set up and seamless to use. 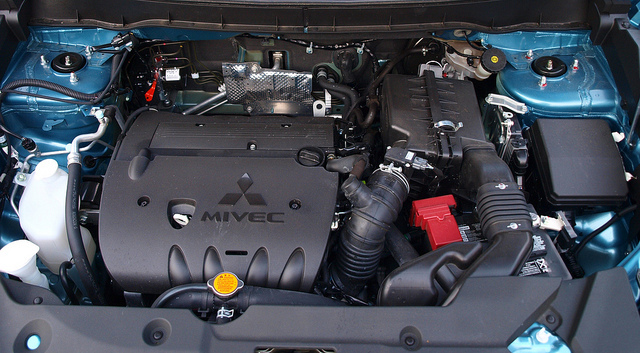 Under the hood is a standard 2.0litre four-cylinder engine straight out of the basic Lancer line. Though it is a noisy motor, the 2.0litre delivers 148 horsepower of smooth unapologetic thrust. Once it settles into a nice cruising range, the engine quiets down and let you relax a bit on the highway. A Continuously Variable Transmission transmits power from the 2.0litre onto the All-Wheel Control four-wheel drive system that is switchable by a button on the center console. Needless to say, this system works very well to supply traction and grip to the eighteen–inch alloys shod with Toyo A24 tries. You could also use the column mounted paddle shifters to change ratios of the CVT, along with a side gear change gate on the console shifter. The suspension on the Outlander Sport felt a bit soft than what would be expected from a sportier crossover. Road imperfections and bumps absorbed just fine. Handling was quite decent in the bends, as long as you take them gently. The softer settings on the suspension may prevent one from driving an Outlander Sport enthusiastically. 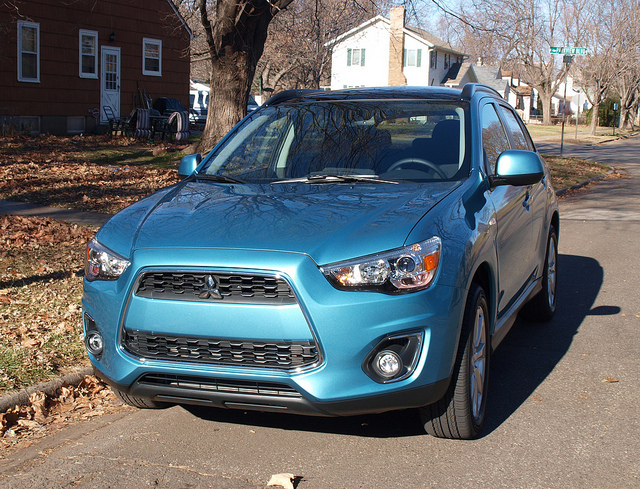 However, if you are one who prefers to drive leisurely, you will absolutely love this Mitsubishi. What you love the most is the steering in the Outlander Sport. Not only does it have a tight turning radius, it has great on-road feel and feedback. One thing to look for is the off-center steering wheel position – just a tad to the right of the center of your body. Do not let that detail color the steering system’s ability to make the right moves when needed. Braking is smooth and to the point. There is no drama to the Outlander Sport’s stopping power in both normal and panic braking. One concern a consumer would have for any size of crossover is fuel efficiency. This was the case in the Outlander Sport as it averaged 23.3MPG on various roads throughout the metro area. It will do much better efficiency-wise once you get it out on the highway and beyond the trappings of the suburbs. The Outlander Sport is also a good value. The starting point for a front-wheel drive, manual gearbox ES model is $19,995. There is quite a bit of equipment for that price. If you simply need more stuff to play with – the navigation system and panoramic roof as included with the SE AWC tester here – the sticker climbs up to $28,570, as seen in this example. 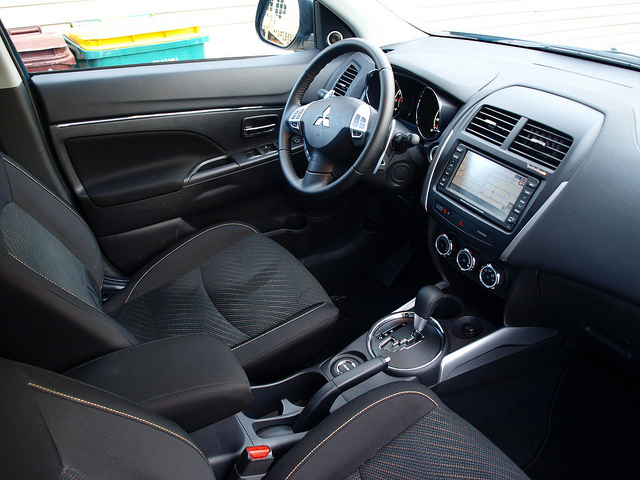 For even more goodies – including leather seating – you could top out an Outlander Sport SE AWC at about $31,495. Sensible shoppers may want to consider something simple for winter driving – such as the ES model with AWC – for just about $25,405. That is one great value to drive away in, if you realize that your ignition will start with a key and there is a solid piece of headliner above you. If you could live with the simple things in life (plus some luxuries) to get through the winter – the Outlander Sport is a great vehicle to choose. Some of your friends already have these to run in. The Outlander Sport is gaining quite a following in the Twin Cities – for all of the reasons stated above. 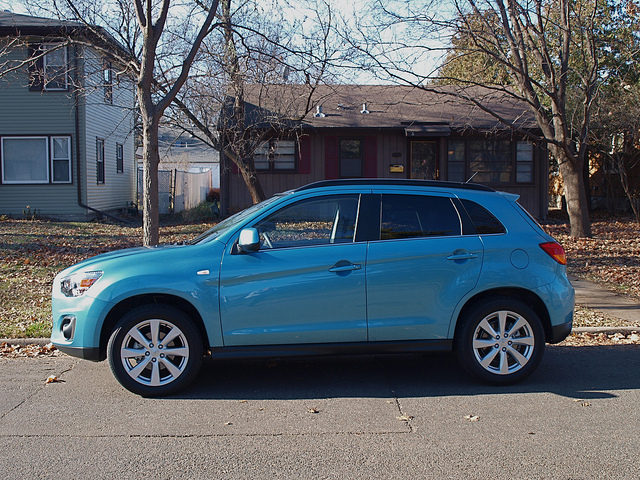 The Mitsubishi Outlander Sport is not too small and not too big. It is just right for those of us who live in Uptown, Grand Ave…practically everywhere we live.